Introduction. We examine doctoral students' awareness of and attitudes to open access forms of publication. Levels of awareness of open access and the concept of institutional repositories, publishing behaviour and perceptions of benefits and risks of open access publishing were explored. Method. Qualitative and quantitative data were collected through interviews with eight doctoral students enrolled in a range of disciplines in a New Zealand university and a self-completion Web survey of 251 students. Conclusions. Low levels of awareness of the university repository remains an issue, and could be addressed by further investigating the effectiveness of different communication channels for promotion. In most New Zealand universities, institutional repository archiving is not compulsory for academics but is often mandatory for doctoral and/or masters students. The University of Auckland and Massey University for instance, have implemented mandatory deposit of theses for all doctoral students enrolled since 1 January 2007. On one hand, open access to postgraduate theses is exciting, as student authors can disseminate their research to a wide audience and may be cited more easily by researchers in their academic community. On the other, open access archiving may raise concerns over copyright, plagiarism and premature publication of findings. Studies focusing on the attitudes of academic staff have been conducted in New Zealand and overseas, but very few studies have been conducted into the attitudes of postgraduate students toward these new models of scholarly publishing. No studies on student perceptions of repository archiving or open access publishing have been conducted in New Zealand, as reflected in the current body of literature. This study attempts to uncover underlying attitudes of a sample of New Zealand doctoral students toward open access publishing and repository archiving in journals and repositories and their attitudes toward the mandatory submission of their theses to their university's repository. Investigating how and from whom awareness, perceptions and attitudes towards these modes of publishing arise is an important facet of the project. Gaining insight into these issues has the potential to contribute to efforts aimed at raising awareness of the benefits of open access and promoting repositories in different disciplines. It is anticipated that an understanding of the attitudes of doctoral students toward open archiving of theses and a better understanding of their research and publishing behaviour could assist university library staff in developing repository submission policies and processes that suit students and in doing so, encourage student collaboration in the ongoing development of repository collections. To what extent are students aware of repositories and open access in the context of scholarly publishing? Do students use documents archived in repositories, open journals and open monographs in their own thesis research? Do students from different disciplines have different perceptions of open access publishing and repository archiving? How and from whom have existing perceptions of repositories and open access publishing been formed? Are students willing to comply with mandatory repository submission policies? The research questions also attempt to address a broader issue: What can institutions do to improve awareness of the role of the institutional repository, address risks or potentially negative aspects of repository archiving and encourage the ongoing use and consistent deposit of doctoral theses in the future? copyright, peer review, revenue (even profit), print, preservation, prestige, career-advancement, indexing and other features and supportive services associated with conventional scholarly literature (Suber 2007). A reoccurring theme within the literature is how to define an institutional repository and its role in the scholarly communication process (Xia and Sun 2007). Lynch's working definition is often cited as it is broad enough to encompass a large number of roles within an institution: 'A set of services that a university offers to the members of its community for the management and dissemination of digital materials created by the institution and its community members' (Lynch 2003). In a widely-cited SPARC (Scholarly Publication and Academic Resources Coalition) paper on institutional repositories, Crow (2002) explains the potential of open access repositories. For Crow, repositories have the potential to create a positive paradigm shift in the processes of scholarly communication in two ways: first, the potential to provide a complement to existing modes of publication and stimulate changes to the current model of scholarly publishing (particularly mitigating the increasing cost of accessing scholarly publishing); and second, the ability to 'make visible' the research outputs of individual institutions in order to 'demonstrate the ... relevance of its research activities' and increase the 'visibility, status and public value' of the institution (Crow 2002: 4). Almost all authors writing about repository archiving report problems in encouraging author participation and use. Davis and Connolly's evaluation (2007) found the Cornell University repository to be under-populated and under-used by academic staff. Key reasons for non-use included preference for existing alternatives to repositories, a perception that repositories were redundant, technical difficulties, concern that their work may be plagiarised, concern regarding quality and status of the repository, and confusion over copyright. Foster and Gibbons's (2005) research into understanding faculty in order to improve repository content recruitment found the majority of researchers did not perceive the repository to be relevant to their needs, nor perceive any potential benefit from using the repository. Apprehension towards repository deposit (and open access publishing in general) seems to centre around three key issues: lack of motivation to self-archive; concerns surrounding intellectual property, copyright and plagiarism; and negative attitudes toward open access publication and archiving as legitimate modes of academic communication. Mandatory deposit policies have been adopted by many institutions to boost repository content and create a sustainable, accessible collection of research outputs (Sale 2006). These policies may apply to specific types of research output, to academic staff outputs, or to postgraduate theses. While mandates take time to be embedded in staff work processes (Sale 2006), they have been shown to be an effective way to achieve growth and guarantee the sustainability of repository collections. However, other repository developers propose that mandates damage goodwill toward the repository as an integral service and that staff buy-in is more important to sustainability than any guarantee of regular submissions of content (Palmer et al. 2008). The principle and intended benefits of open access publishing and archiving do receive widespread support among the majority of academic authors (Kingsley 2008; Pickton and McKnight 2006). Archiving allows for greater exposure of a work (e.g., through Google Scholar), thus a greater potential for research impact (Cullen and Chawner 2009a; Kingsley 2008). Increased exposure is partly achieved by increasing readership through the inclusion of researchers who would not normally have access to subscription journals (Kingsley 2008). In addition, archiving allows research outputs to be preserved in digital form, making them easier to retrieve in preparation for funding or promotion rounds (Performance-Based Research Fund Sector Reference Group n.d.). Within the literature, academics are reported to be concerned about the same set of risks or barriers associated with repository deposit. Authors' concern over the ability to publish if a pre-print of an article (or a thesis) is already available in an institutional repository is often mentioned. Confusion and concern over copyright, provenance and quality control, particularly the risk of copyright infringement or plagiarism, is also a recurring theme in the literature (Cullen and Chawner 2009a; Davis and Connolly 2007; Gadd et al. 2007; Pickton and McKnight 2006; White 2008). The 2007 comparison of two JISC surveys (Gadd et al.) concludes with the notion that there is no single copyright solution for repository archiving, due to the diverse types of research outputs held (e.g., data sets, teaching materials, grey literature, theses, pre- and post-prints and publisher's PDF files). Academic disciplines differ in their processes of research, publication, recognition and reward. In the literature, different disciplines are described as having differing attitudes to repositories and open access publication, depending on the fit between existing publishing channels and the new options offered by open access. In relation to the humanities disciplines, Cheverie et al. (2009: 220) describe an entrenched culture of 'professional prejudice against digital scholarship'. Researchers (and their students), particularly those in monograph-based publishing cultures, perceive that archiving or publishing in an open access journal may damage their future careers (Cheverie et al. 2009; Jöttkandt and Hall 2007; Pickton and McKnight 2006). Attitudes toward open access differ dramatically in the sciences, where speed of publication and communication of results is of paramount importance. Researchers in the sciences have more readily embraced open access in the form of peer-reviewed open journals (e.g., PloS: Public Library of Science) and the publication of pre-prints in subject-based repositories such as arXiv. For a researcher in a fast-moving discipline such as computer science, archiving a work in a repository is similar to existing research and scholarly communication processes (Kingsley 2008). Disciplinary differences appear to extend to the next generation of researchers. Pickton and McKnight's (2006) study of graduate students at Loughborough University found science students to be more willing to comply with mandatory submission of their theses to the university repository than their fellow students in the humanities. Both aversion to and embrace of open access appear to be socially constructed within the disciplines in accordance with their existing publishing norms (Cheverie et al. 2009; Duranceau 2008; Kingsley 2008). Despite their value as original research, master and doctoral theses have traditionally been considered grey literature, due to their physical inaccessibility (Jones and Andrew 2005). In addition to boosting repository statistics, the inclusion of electronic theses in repositories allows original research undertaken by emerging scholars to be visible, accessible and able to be used by the wider research community. Statistics indicate that theses that are made available in this way are more widely used and cited in ongoing research (Troman et al. 2007). Few studies focus specifically on the role of student work in repositories. Two papers by Pickton and McKnight (2006; 2007) focus on the perceptions and needs of postgraduate students. Their 2006 paper found the majority of students to be enthusiastic about making their theses and other research outputs available through repositories. Support for the principle of open access was found to be a major motivating factor. However, students were found to hold many of the same concerns around open access and archiving as academic staff, particularly regarding plagiarism, quality and hindering later publication in journals (Pickton and McKnight 2006). The second paper considers the inclusion of student work in repositories from the perspective of repository managers. Through responses from thirty-five institutions, it was found that repository managers 'overwhelmingly believe that there is a place for research student output' (Pickton and McKnight 2007: 158-159) but that many believed the work to be deposited must meet certain criteria to ensure quality control. Some repository managers indicated that they were attempting to address lack of awareness of repositories by including information about the repository in postgraduate research skills training. In the current research, two theories were used to model students' perceptions of open access publishing and repository archiving. The first, Rogers's diffusion of innovations theory was used to model students' awareness and use of open access resources in their own research. The second, social exchange theory was used to model students' attitudes toward the perceived costs or benefits of sharing their thesis work with the wider community through an institutional repository. Rogers's diffusion of innovation theory provides a conceptual framework for explaining how and why innovations (defined as new tools, processes or ideas) come to be adopted by certain groups. According to Kingsley's (2008) recent work mapping Rogers's theory to empirical findings from qualitative interviews with academic staff, institutional repositories perfectly represent Rogers's concept of an innovation as 'an idea, practice or object that is perceived as new by an individual or other unit of adoption' (Rogers 1995: 11). Observability: an innovation is more likely to be adopted (or at least experimented with) if it is visible, or being seen to be used within a particular community. So, then, as an innovation, institutional repositories will be more likely to be adopted by doctoral students if it is perceived to be advantageous to place work in repository collections and if repositories are consistent with existing publishing and research practice, easy to use, known and easy to access. direct reward (social, professional/career, or financial). Studies in the related field of knowledge management successfully utilise social exchange theory in order to explain open information sharing behaviour in professional environments (Kankanhalli et al. 2005; McLure-Wasko and Faraj 2005). Social exchange theory suggests that individuals are motivated to interact or share social goods (in this case, information and knowledge) with one another based on an expectation that doing so will lead to a return or reward, particularly approval, enhanced status or respect (McLure-Wasko & Faraj 2005: 39). In the academic environment, then, authors could be more inclined to participate in the repository archiving process if they perceive that it may lead to a social or professional reward in the form of increased readership, research impact and citation rates, feelings of altruism toward the research community and public, enhanced status, peer respect or career advancement or promotion. This research uses a mixed-methods approach consisting of two stages: qualitative semi-structured interviews, followed by a quantitative self-completion questionnaire. The semi-structured interviews explored possible perceptions and attitudes to open access publishing and archiving and how these perceptions were formed. The data collected in the interviews formed the basis of a quantitative survey in an attempt to expand on and test the interview data to see whether perceptions revealed in the interviews were consistent among a larger sample of doctoral students. The study utilises a sequential exploratory design (Cresswell et al. 2003: 225), the purpose of which is to use quantitative data to test, consolidate and assist in the interpretation of the qualitative findings. Massey University was chosen as a sample population as it is one of the two universities in New Zealand that have implemented mandatory deposit of theses for all doctoral students enrolled since 1 January 2007. It also has an established doctoral programme, spreading over three campuses in the North Island (Albany, Manawatu and Wellington). Massey University teaches across five colleges: Science, Humanities and Social Sciences, Education, Creative Arts and Business, allowing the researchers access to students in a wide range of disciplines. There were 901 doctoral students enrolled at Massey University as of October 2009 and 382 of these had enrolled since 1 January 2007. Table 1 provides a breakdown by discipline. The interview stage involved a purposive sample of eight doctoral students enrolled at the time of data collection across the colleges and disciplines. Two students from each of the Colleges of Business, Humanities and Social Sciences, Education and Sciences were interviewed. Students of the College of Creative Arts were omitted from the interview stage of the project due to the small population of doctoral students. All eight interviews were digitally recorded. Data were collected by direct transcription of the interview audio recording and hand-written notes taken during the interviews. The second stage of the study was administered via a Web-delivered self-completion questionnaire, with questions drawn from the findings of the interview data and from the research literature, particularly the results of Pickton and McKnight's (2006) study of graduate students and the postal survey instrument used by Cullen and Chawner (2009a). Survey Monkey was used to build and deliver the survey. A Web survey was used to reduce the cost of the survey process and increase the speed of data collation and analysis (Bryman 2004). NVivo 8 was used to sort, store and analyse the interview transcripts by theme. The interview transcripts were analysed using a grounded theory approach as described in Bryman (2008) and Charmaz (2001; 2006) which allows key concepts, themes and theories to emerge through the systematic collection, analysis, comparison and interpretation of data. The two-phase approach to coding described in Charmaz (2006) and outlined in Bryman (2008) was used. An initial intensive, line-by-line approach was used to analyse the first few interviews and build a bank of themes and through comparing the codes and themes of the first few interviews, guide further data collection and coding. In the later focused coding phase, the most frequently occurring themes were retained, while many of the peripheral themes were either merged or dropped altogether (Charmaz 2006). The interview data were also mapped against criteria from the theoretical framework. This additional coding was intended as a further aid to interpretation of the interview data. The codes, themes and extracts of text from the analysed data were then used to inform the design and wording of the fixed-choice questions in the Web survey. willingness to comply with mandates and deposit their theses in the university institutional repository. Roger's five characteristics of innovation were used in conjunction with the four key motivations for participation of Social Exchange Theory to frame the interview questions and survey instrument and as an aid to the interpretation of the qualitative data. Students were asked about their awareness and use of institutional repositories in their own research practices (observability, complexity and trialability); whether they thought institutional repositories and open access were advantageous, convenient or useful when compared with traditional models of publication and information retrieval (relative advantage, reciprocity, perceptions of altruism or self-efficacy); and whether they thought depositing work in repositories would benefit or harm their research career (compatibility and relative advantage, reciprocity, gains in influence, reward). The interview participants were a purposive sample of eight currently enrolled doctoral students, with two from each of the colleges of Business, Education, Sciences and Humanities and Social Sciences. Three students were enrolled prior to 2007, while five were enrolled after 1 January 2007 and thus were obliged to deposit their theses under the mandatory submission policy. From a population of 901 enrolled doctoral students (as at October 2009), 251 took part in the survey, with a 91% completion rate (a response rate of 28%). Of these respondents, 33 (14.5%) had enrolled before 2007 and 194 (85.5%) had enrolled since 1 January 2007 and were thus covered by the mandatory submission policy. 109 of the respondents were male (43%) and 142 were female (57%). 49 respondents held an academic position and 13 held a general staff position at Massey University. 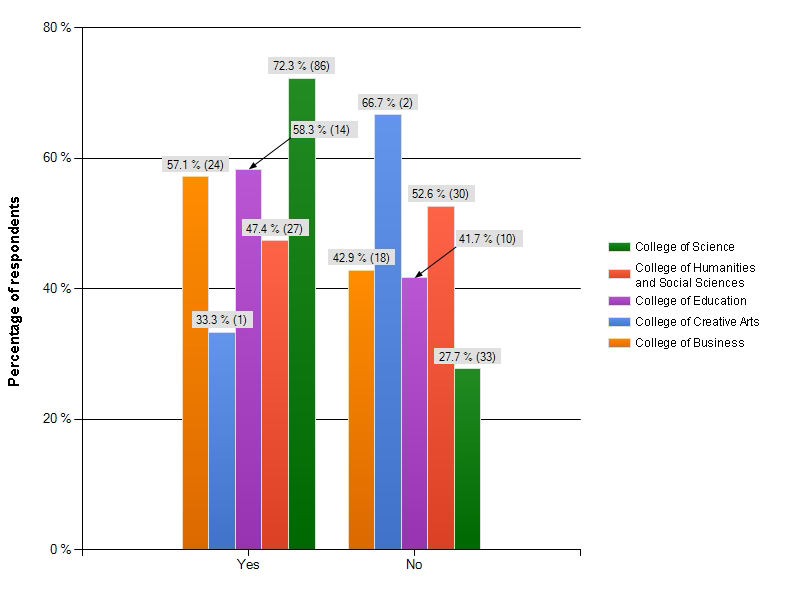 The breakdown of respondents by college (broad discipline) was uneven (see Figure 1), with the largest group of respondents coming from the College of Sciences (48.6% of respondents). However, when college enrolment figures are taken into consideration, the response from each college was fairly even, with response rates ranging between 25% (College of Sciences) and 34% (College of Business). Only two of the eight interview participants (both from College of Sciences) could describe the concept of open access. 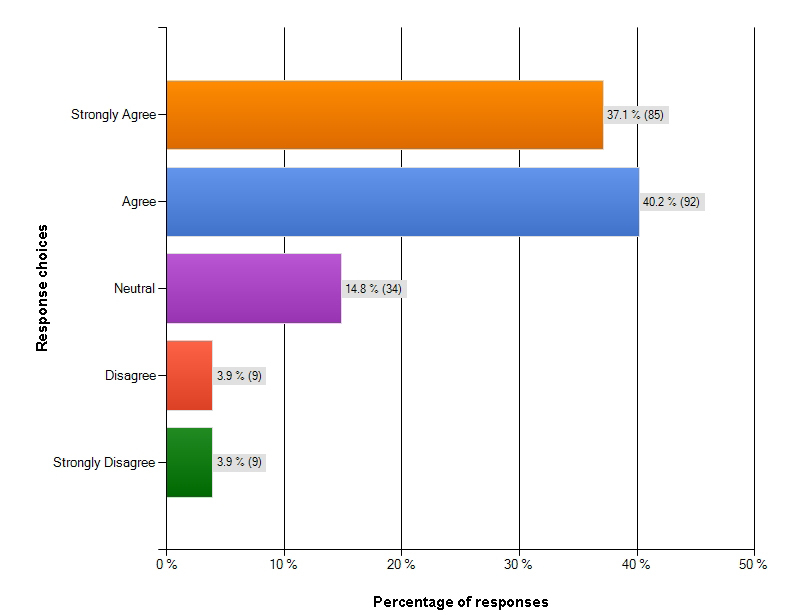 Among the survey respondents, perceived level of awareness appeared relatively high, with 62% (152) of respondents indicating that they were aware of the concept of open access prior to beginning the survey. However, there could be a bias in this data: participation in the survey was voluntary and those who responded to the survey on open access and repositories are more likely to be interested in and aware of, open access than those who did not. In addition, the interview responses show that awareness does not necessarily indicate an understanding of open access. Levels of awareness (as summarised in Figure 2) were highest among respondents from the College of Sciences with 72.3% (86) indicating that they were aware of the concept of open access. This higher level of awareness among the science interviewees and survey respondents is unsurprising considering the existence of subject-based repositories operating in the scientific community such as arXiv and Cogprints (Swan and Brown 2005). Consistent among the responses from interviewees and survey respondents was support for the concept of open access, the importance of making research available to the wider public and removing cost as a barrier to accessing research. One interview participant from the College of Sciences mentioned that she had heard that open journals were not as prestigious as other journals, but would continue to use them and publish in them because she preferred the concept of open access journals to traditional proprietary journals. In the survey data, 86.3% (195) of respondents either agreed or strongly agreed with the following statement on the benefit of open access: Open access is important because it removes cost as a barrier to accessing research and allows public access to research and information. The desire to widen public access to information and the importance of altruism should not be underestimated and are evident in other studies in the literature. In Cullen and Chawner's (2009b) recent survey of New Zealand academic staff, altruistic intent in making work available to the public was established as one of the 'chief reasons' for making work available open access. Swan and Brown (2004) found the principle of free, open access for all readers to be an important reason for publishing in open access journals. Similarly, postgraduate participants in Pickton and McKnight's study felt that the principle of open access was 'an important motivating factor' for the deposit of theses (2006). So, the concept of open and equitable access is supported by the majority of authors, which will be useful to bear in mind when marketing repositories to doctoral students (and academic staff). Six of the eight interviewees were aware of the concept of an institutional repository and five were aware of the existence of an institutional repository at Massey University. Those who were aware of the institutional repository at Massey University (Massey Research Online) had found out about it through Graduate Research School communications. Two students mentioned that they had found out about repositories and Massey Research Online through the Library, one through a recent Knowledge Management in Research course for staff and postgraduates. The other had found out through a research consultation with a library staff member. Less than half of the survey respondents (48%; 117) indicated that they were aware of the concept of a repository, while 52% (127) were aware of the existence of Massey Research Online. While levels of awareness of the existence of the repository were high among the interviewees, deeper knowledge of the concept of the repository and what it is for or can do were lacking. Even when interviewees knew about the concept and existence of the repository, their knowledge of repositories and the way they worked was vague. For example, the majority of interviewees were not aware that material in repositories is indexed by Google Scholar, making repositories a powerful tool for disseminating their research. Low levels of awareness (normally falling between 45-55% of respondents) of repositories despite marketing and advocacy campaigns is consistently referred to in the institutional repository literature (Abrizah 2009; Davis and Connolly 2007; Watson 2007). This lack of awareness of institutional repositories indicates that alternative approaches to promotion are needed if doctoral students are to be made aware of repositories and their role in making their research available to a global audience through Google Scholar. Only 17.6% (43) of survey respondents had lodged a piece of work in an institutional repository and 70.5% (31) of those had deposited their master's thesis. Only one interviewee had lodged work in an institutional repository and only two interviewees mentioned that they used institutional repositories directly in order to access research. Seven of the eight interviewees indicated that they accessed Massey research and/or theses through Google Scholar or the Massey Library catalogue, but were not necessarily aware that they were using the university's repository in the process. One student said that he did not use repositories as his research needs were met by libraries and the Internet. However, it is likely that many of the articles the interviewees had accessed using Google Scholar (and Google) were in fact held in repository collections, or were articles published in open access journals. 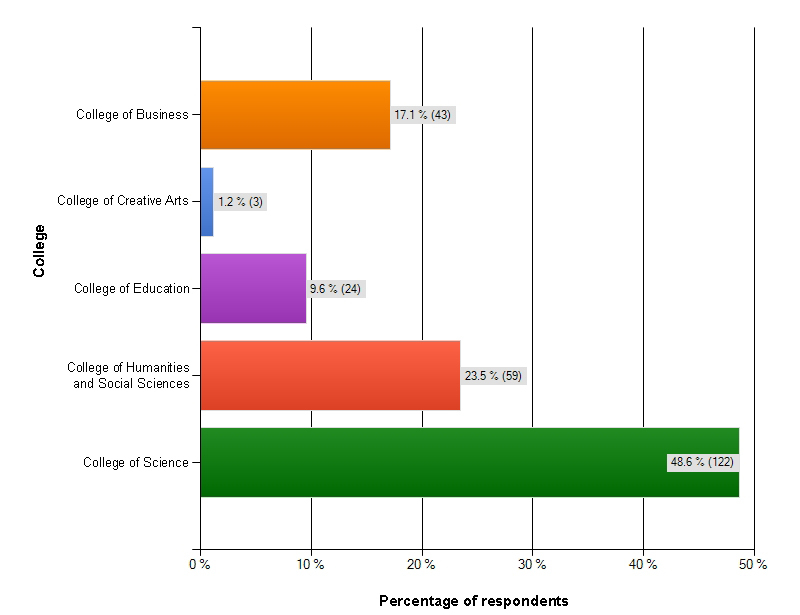 Among the survey respondents, 51.2% (125) indicated that they had accessed a repository. 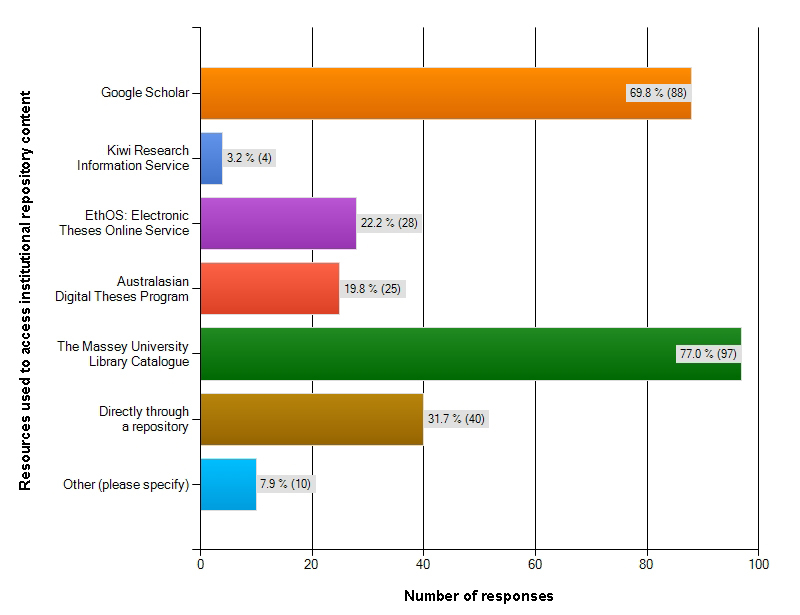 The Massey Library catalogue was the most common mode of accessing content in the repositories at 77% (97 respondents), while 69.8% (88 respondents) indicated they had used Google Scholar (see Figure 3). EThOS (22.2%; 28), Australasian Digital Theses (19.8%; 25) and direct access (31.7%; 40) were also noted modes of access. Only 3.2% (4) of survey respondents who indicated they had used an institutional repository had used the Kiwi Research Information Service. 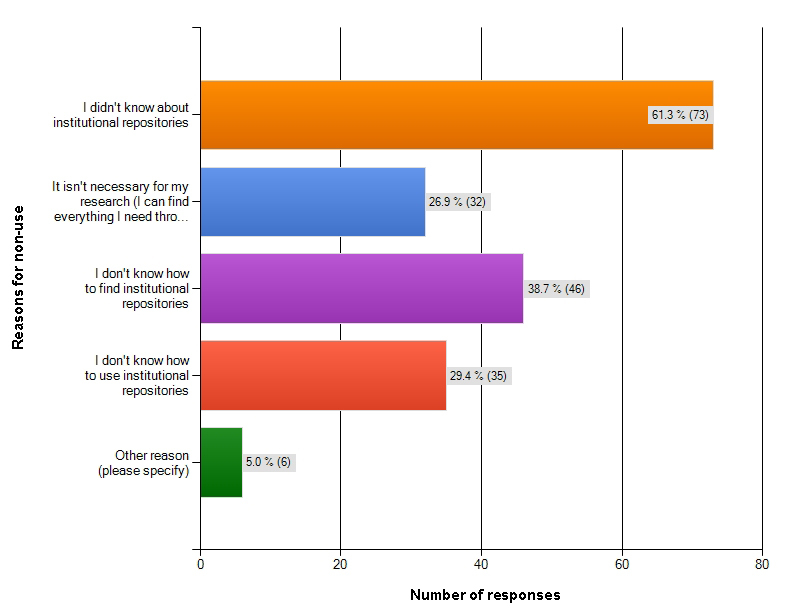 The primary reason for non-use of repositories was lack of awareness, with 61.3% of the 119 survey respondents who had not used institutional repositories to access research choosing the option 'I didn't know about institutional repositories' (see Figure 4). Additionally, 26.9% (32) of respondents who answered this question indicated that they did not think that repositories were necessary for their research. This perception is documented elsewhere in the literature among academic staff, who feel that their research and publication needs are met by existing processes of publication and libraries' journal subscriptions (Davis and Connolly 2007; Foster and Gibbons 2005). All interviewees said that they used a wide range of online catalogues and article databases to find information for the literature review stage of their research. However, one resource stood out as the most frequently used resource: Google Scholar, with 91.8% (224) of respondents indicating that they used it during the literature review process. However, only one interviewee (from the College of Sciences) was aware that material in Massey Research Online and other repositories appears in Google Scholar. None of the other interviewees were aware of this despite indicating that they used Google Scholar. Use of institutional repositories within the research and literature review processes (as opposed to the author deposit) is seldom mentioned in the institutional repository literature. Studies (including this one) tend to focus on rates of deposit and author willingness to deposit (Davis and Connolly 2007; Foster and Gibbons 2005) or on compliance with mandates (Sale 2006). That is, they focus on the role of the author as the producer of research, rather than on users as consumers of research (measured by downloads or rates of use). However, as all researchers are both producers and consumers of research, it is interesting to note that approximately half of survey respondents had used repositories to access research, but only 31% of these students had used the repository directly. As respondents were most likely to access an institutional repository indirectly, optimising the integration (and interoperability) with existing research services and tools is important to ensure university repository collections are visible on the Web. In addition, it is important to note the role of Google Scholar and library catalogues when marketing an institutional repository to students or academic staff. Almost all interviewees and survey respondents indicated that they use these two tools. If students are aware that repository content appears in Google Scholar and in library catalogues, it is likely that they will be more motivated to archive their work. Survey respondents either agreed or strongly agreed with the majority of benefits listed in the survey. In particular, 52.9% (119) strongly agreed and 33.8% (76) agreed that removing cost as a barrier to access is a benefit. 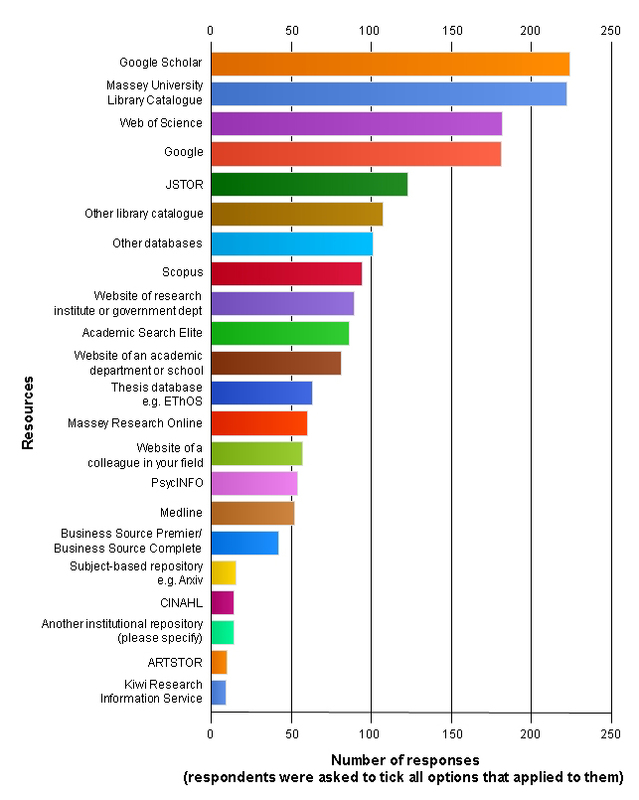 Opportunities for professional networking, feedback, exposure on Google Scholar and the ability to share work with students, other researchers and the public were all perceived to be benefits of repository archiving (see Table 2). As the benefits listed in the survey were drawn from the literature and interview data, results reflect benefits already reported in the literature, particularly the public benefit of open access, enhanced exposure of work through Google Scholar and the potential for increased citation, and the potential to receive feedback and commentary (Cullen and Chawner 2009a; Kingsley 2008; Pickton and McKnight 2006). The perceived risks described by the interview participants included the potential conflict of interest with journal publishers, concerns around plagiarism (particularly in relation to theses) and a perception that open access was less prestigious than traditional forms of publication. Two interviewees expressed concern over opening themselves up to criticism by placing their thesis work in the public domain. Survey respondents had similar concerns, but overall, results were more balanced, with the majority of responses falling in the neutral category, indicating uncertainty or ambivalence to the presented risks (see Table 3). The two risks that caused the most concern included the copying or use of work without permission and plagiarism. Conflict of interest with journal publishers and issues over copyright restrictions were also noted. Confusion regarding journal publishers' copyright restrictions and concern that work may be plagiarised or used without permission are frequently mentioned in the wider literature (Cullen and Chawner 2009a; Davis and Connolly 2007; Gadd et al. 2007; Pickton and McKnight 2006; Watson 2007; White 2008). Most frequently mentioned is author concern over the conflict of interest with journal publishers and the effect of archiving on an author's ability to publish if the pre-print (or in this case, a whole thesis) is openly available. These issues are unlikely to ever be fully resolved in a short term, due to the wide variety of permissions and restrictions associated with different journal publishers. With the help of online directories such as SHERPA Romeo, library liaison staff and/or repository administrators are in a position to advise on problems around electronic copyright and publishers' permissions, as part of their liaison and outreach services. Interviewees mentioned a variety of influences on where and how they would publish their doctoral research. Other than their own opinion, supervisors were identified as a major influence, while colleagues, tutors, departmental guidelines and publishing by invitation were also mentioned. Most survey respondents (79.5%; 189) chose agree or strongly agree when presented with the following statement: I publish where my supervisors recommend I publish. While repository deposit is not the same as peer-reviewed publication, this result indicates that respondents may be influenced if, for example, a supervisor recommended they deposit their thesis in a repository. This finding is consistent with the results of Pickton and McKnight's study (2006), in which students were found to be willing to be encouraged by supervisors and their departments to deposit their work. Therefore, it is important for library staff and/or repository administrators to work with supervisors and academic staff when communicating the electronic thesis submission processes. The NZ tax-payer paid for most of the inputs to the research (university staff and facilities) so should have free access to the work. Open knowledge is very important, not only for the sake of my thesis but for the sake of the society as a whole. I think it's fantastic to be able to access theses online. It may mean someone actually reads it! Please indicate whether you agree with the following statement: Except in the case of an embargo, all doctoral theses should be made openly available through an institutional repository. I believe it should be the choice of the student to publish their thesis in that format. Keeping in view the benefits and risks of institutional repository, I am neutral on this question. I feel that it should be the choice of the individual student. I am concerned about plagerism [sic] by having it online and strongly oppose having my research published electronically. Of the 33 survey respondents who were enrolled before 2007, 83.3% (25) indicated that they would voluntarily place a copy of their thesis in Massey Research Online. Of the 194 respondents who were enrolled after 1 January 2007 (and are thus covered by the mandatory submission policy), 92.6% (176) indicated that they will willingly comply with the mandatory submission policy. Only 7.4% (14) of respondents indicated that they would not be willing to comply. Within the literature, opinion is divided regarding the necessity for (or wisdom of) mandatory submission policies for student and staff research output. Some stakeholders argue that mandates could do more harm than good in relation to depositor buy-in, preferring a library liaison and advocacy approach, while others (including some of the academics themselves) are unconcerned by mandatory deposit policies (Palmer et al. 2008). Other authors argue that mandates are 'the only way' to achieve appropriate submission rates (Sale 2006). The results of this study indicate that the mandatory submission policy is widely accepted by the survey respondents and should remain in place as a key strategy for increasing the visibility of the research output of the university. This result is consistent with the findings of research by Pickton and McKnight (2007) and Swan and Brown (2005), in which the majority of students and academics (respectively) were found to be willing to comply with a mandatory deposit policy. From the disciplinary differences described in the literature, it would be expected that students from different colleges would have widely differing levels of awareness of open access and repositories, and different attitudes toward the respective benefits and risks associated with repository publishing. For example, Cheverie et al. (2009) describe an 'entrenched culture of professional prejudice against digital scholarship' and report among academics in the humanities, for instance, a perception that archiving or publishing in an open access journal may harm their careers (Cheverie et al. 2009; Jöttkandt and Hall 2007; Palmer et al. 2008), while in some scientific disciplines, researchers describe a culture that embraces open access repositories as a normal part of the scholarly communication process (Kingsley 2008). Pickton and McKnight's study of graduate students at Loughborough University (2006) found that science students were more willing to comply with mandatory submission of their theses to the university repository than their fellow students in the humanities. 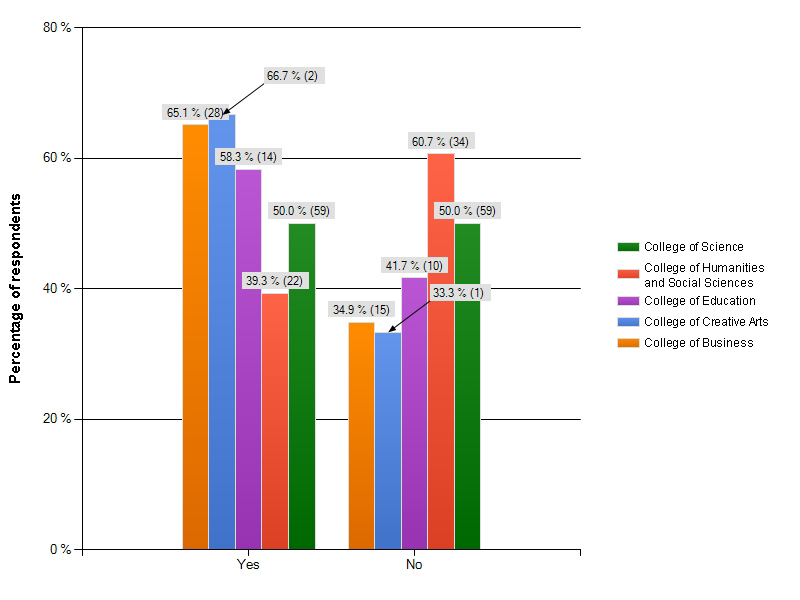 Among the survey respondents, awareness of the concept of open access was highest among the College of Science candidates, at 72.3% (see Figure 7) and awareness of the concept of a repository was highest among the College of Education and College of Business respondents at 58.3% and 53.7% respectively. In addition, awareness of Massey Research Online was highest among College of Education and College of Business respondents, at 66.7% and 64.3%. Prior to reading the definitions above, were you aware of the concept of Open Access as it relates to scholarly (academic) publishing? Respondents from the College of Humanities and Social Sciences were found to be the least frequent users of repositories, with 39.3% indicating that they had never used repositories to find research (see Figure 8). However, there was less of a difference between the response profiles of the different disciplines than expected, given the differences in research and publication cultures described by researchers working with academic staff populations (Jöttkandt and Hall 2007; Kingsley 2008). Have you ever accessed a repository to find your own research, a colleague's research or to look for other research? There was a high level of willingness to comply with the mandatory thesis deposit policy. Positive responses ranged between 91.6% from respondents in the College of Science to 100% in the College of Creative Arts. While there are some differences between the colleges, the differences found in this study were certainly less marked than those previously discussed in the literature. This result may be specific to this doctoral population, or may represent a growing acceptance of open access and/or Internet-based resources within the research and scholarly communication process. The theoretical framework was used as an aid in the development of the interview guide and survey instrument. In addition to a grounded theory approach to coding and analysis, the interview data were concurrently coded against the categories of the theoretical framework as an alternative aid to interpretation. Codes regarding awareness and use were mapped against Rogers's diffusion of innovations criteria, to determine the extent to which institutional repositories can be considered an effective innovation. The data were also mapped against the four criteria of social exchange theory in an attempt to determine the extent to which the practices and processes of publication and scholarly communication operate as a kind of social exchange or transaction within the world of academia. While the majority of codes did not easily fit the assigned criteria, a few key themes and observations emerged through this process. This observation is consistent with existing usability (trialability and complexity) issues in a study by Lindahl and Foster (as cited in Bevan 2007) in which DSpace failed usability tests (Massey Research Online is a DSpace installation). In this case, complexity is likely to be a barrier to accessing and using repositories directly, but not a barrier to accessing repository content through Google Scholar or library catalogues which have been found to be widely used by the respondents. This result highlights the importance of optimising repository metadata for discoverability through existing research portals and search engines such as Google Scholar, the Kiwi Research Information Service and the Australasian Digital Theses. Interviewees indicated that they did not expect direct reward from the open access archiving of their theses. However, interviewees expressed that they thought their work would be more likely to be cited or read if placed in a repository which was perceived to be a benefit. Interviewees indicated that they wanted to be able to find other students' work online, share their findings with the community and contribute to the wider research community. The fact that the majority of survey respondents favour mandatory submission could be an indication that they expect to share their own work with the research community and use other students' thesis work within their own research. Among the survey respondents, 95% wanted to see other students' doctoral theses in institutional repositories. Within the doctoral community, the process of conducting research and publication can be considered a form of social exchange. From the results, it appears that students are motivated to share their work and they expect to access other students' work during their own research. Students also expect to benefit from sharing their work, particularly from increased exposure and potential to build professional networks, and by boosting their confidence with feelings of altruism and self-efficacy; feeling they are making a contribution to their research community and public knowledge. As an innovation, repositories operate as an effective means to share doctoral work and have clear advantages over the traditional publication format of theses in print. As an innovation, repositories allow researchers to push their research to the international research community as never before and appear to have widespread support among the doctoral student community at Massey University. However, the diffusion of institutional repositories throughout the academic community is still at a relatively early stage. There is some way to go before there is widespread awareness and adoption of open access archiving. This exploratory study represents an attempt to uncover the underlying attitudes of New Zealand doctoral students toward open access publication and institutional repositories, as well as their attitudes to the mandatory submission of their theses to their university repository. The study shows that awareness of open access and institutional repositories is still fairly low, even in a research-focussed community of doctoral students. While the majority of interview and survey respondents indicated that they support the concept of open access, the interview transcripts indicate that most respondents lack a deep understanding. Given that the mandatory submission policy has been in effect since 2007, all students are given information on repository submission via the Massey University Doctoral Handbook, policy information is available online via the Graduate Research School and Library Websites and Massey Research Online is linked from the library homepage, awareness of the university repository remains surprisingly low. However, high levels of awareness and support for open access and repository archiving among those interviewees who had attended a postgraduate Knowledge Management in Research library course indicate that this could be an effective forum in which to communicate information regarding the mandatory deposit policy. In terms of doctoral students' use of repositories and open journals in their own research, results indicated that only a relatively small number of the respondents used open access research services like Kiwi Research Information Service, Australasian Digital Theses and EthOS. However, the overwhelming majority of respondents used Google Scholar, so it is likely that they access open access material from journals and repositories without realising it. A small amount of data regarding the use of open journals in research and publication emerged from the interviews, but was not enough to adequately answer research sub-question: Do students use repositories and other open access journals and monographs in their own thesis research? Further research into the use of open access resources in scholarly research may be useful to investigate emerging publication and citation trends. In relation to benefits and risks, respondents had similar perceptions and concerns to those of academic staff and UK postgraduate students already documented in the literature. The respondents perceived that repository publication of theses was beneficial both for themselves and the research community, but had concerns regarding copyright and the potential for plagiarism. Concern over the effect of archiving of theses on future publication was a recurring theme in the literature and in the current research, but was not able to be addressed within the scope of this project. In order to address this concern within the academic community, an investigation of publishers' perceptions of open access and institutional repository deposit and the effect of repository archiving on future publication may prove a useful contribution to the institutional repository literature. There appears to be an overwhelming support for the principle of open access in enabling public access to research. Knowledge-sharing for the public good was clearly a key principle for the doctoral students surveyed and one that may not yet have been explored by library and Graduate Research School staff when promoting repositories to the doctoral student community. Finally, the ubiquity of Google Scholar as a research tool cannot be ignored. It was found to be used by almost all respondents from all disciplines and is accessible to those researchers working outside the university environment. Making students (and staff) aware that if their work is in a repository it will then be available on Google Scholar could be a useful promotional strategy. While there were some differences in awareness of open access and repositories between the disciplines, they were not as marked as expected, considering the differences described in the literature. When separated by college, responses concerning attitudes toward the benefits and risks associated with repository archiving and open access forms of publication were surprisingly similar. Hopefully, this result indicates that the next generation of researchers in all disciplines are increasingly open to new models of research publication and are perhaps more comfortable in the online research environment than their earlier counterparts. However, it is important for repository administrators and library staff to consider the perceptions of academic staff and supervisors, as they were found to have the greatest influence on the perceptions of the respondent group. This study indicates that the mandatory deposit policy is a useful strategy to build the core collection of an institutional repository and one that is supported by the majority of survey respondents. The majority of respondents either agreed or strongly agreed that theses should be made openly available online. In addition, over 90% of survey respondents who were covered by the mandatory deposit policy were found to be willing to comply. It was also interesting to note that 83% of the respondents who were not covered by the policy were willing to voluntarily deposit a copy of their thesis in the repository. The key recommendation for the library and information profession is to ensure that the mandatory submission policies and the benefits of repositories are communicated to students through a variety of channels including academic supervisors, official research school communications, handbooks, library workshops and other liaison or outreach services in order to ensure that each student understands the purpose and benefits of archiving their theses. Abrizah, A. (2009). The cautious faculty: their awareness and attitudes towards institutional repositories. Malaysian Journal of Library and Information Science, 14(2), 17-37. Bevan, S.J. (2007). Developing an institutional repository: Cranfield QUEprints: a case study. OCLC Systems & Services, 23(2), 170-182. Bryman, A. (2008). Social research methods. (4th ed.). Oxford: Oxford University Press. Charmaz, K. (2001). Grounded theory: methodology and theory construction. In N.J. Smelser & P.B. Baltes (Eds. ), International encyclopedia of the social & behavioral sciences (pp. 6396-6399). Oxford: Pergamon Press. Cresswell, J.W., Clark, V.L.P., Gutmann, M.L. & Hanson, W.E. (2003). Advanced mixed methods research designs. In A. Tashkkori & C. Teddlie (Eds. ), Handbook of mixed-methods in social and behavioral research (pp. 209-240). Thousand Oaks, CA: Sage Publications. Duranceau, E.F. (2008). The 'Wealth of Networks' and institutional repositories: MIT, DSpace and the future of the scholarly commons. Library Trends, 57(2), 244-261. Gadd, E., Loddington, S. & Oppenheim, C. (2007). A comparison of academics' attitudes towards the rights protection of their research and teaching materials. Journal of Information Science, 33(6), 686-701. Homans, G. C. (1958). Social behavior as exchange. The American Journal of Sociology, 63(6), 597-606. Jones, R. & Andrew, T. (2005). Open access, open source and e-theses: the development of the Edinburgh Research Archive. Program: Electronic Library and Information Systems, 39(3), 198-212. Kankanhalli, A., Tan, B.C.Y. & Wei, K.-K. (2005). Contributing knowledge to electronic knowledge repositories: an empirical investigation. MIS Quarterly, 29(1), 113-143. Kingsley, D. (2008). Those who don't look don't find: disciplinary considerations in repository advocacy. OCLC Systems & Services, 24(4), 204-218. MacCallum, C. J. (2007). When is open access not open access? PLoS Biology, 5(10), 2095-2097. McLure-Wasko, M. & Faraj, S. (2005). Why should I share? Examining social capital and knowledge contribution in electronic networks of practice. MIS Quarterly, 29(1), 35-57. Palmer, C.L., Teffeau, L.C. & Newton, M.P. (2008). Strategies for institutional repository development: a case study of three evolving initiatives. Library Trends, 57(2), 142-167. Performance-Based Research Fund. Sector Reference Group (n.d.). Performance-Based Research Fund Sector Reference Group review: managing nominated research outputs. Wellington, New Zealand: Tertiary Education Commission. Pickton, M. & McKnight, C. (2006). Research students and the Loughborough institutional repository. Journal of Librarianship and Information Science, 38(4), 203-219. Pickton, M. & McKnight, C. (2007). Is there a role for research students in an institutional repository? Some repository managers' views. Journal of Librarianship and Information Science, 39(3), 153-161. Rogers, E.M. (1995). Diffusion of innovations (4th ed.). New York, NY: The Free Press. Swan, A. & Brown, S. (2004). Authors and open access publishing. Learned Publishing, 17, 219-224. Thibaut, J.W. & Kelley, H.H. (1959). The social psychology of groups. New York, NY: John Wiley & Sons. Troman, A., Jacobs, N. & Copeland, S. (2007). A new electronic service for UK theses: access transformed by EThOS. Interlending & Document Supply, 35(3), 157-163. Watson, S. (2007). Authors' attitudes to, and awareness of, a university institutional repository. Serials, 20(3), 225-230. Xia, J. & Sun, L. (2007). Factors to assess self-archiving in institutional repositories. Serials Review, 33(2), 73-80.